Mar. 12, 2013 — In laboratory studies, Johns Hopkins researchers say they have found that stem cells from a patient’s own fat may have the potential to deliver new treatments directly into the brain after the surgical removal of a glioblastoma, the most common and aggressive form of brain tumor. The investigators say so-called mesenchymal stem cells (MSCs) have an unexplained ability to seek out damaged cells, such as those involved in cancer, and may provide clinicians a new tool for accessing difficult-to-reach parts of the brain where cancer cells can hide and proliferate anew. The researchers say harvesting MSCs from fat is less invasive and less expensive than getting them from bone marrow, a more commonly studied method. UC San Francisco researchers have found that certain rare cells extracted from adult breast tissue can be instructed to become different types of cells – a discovery that could have important potential for regenerative medicine. As with human embryonic stem cells, the newly found cells are pluripotent, or capable of turning into most cell types, the authors said. The scientists discovered that when the cells were put either in mice, or in cell culture, the cells could differentiate to produce multiple cell types, including those that proceed to make heart, intestine, brain, pancreas and even cartilage. The finding is significant, the authors said, because scientists previously believed that pluripotent cells did not exist in the body after the embryonic stage of human development. Additionally, the cells can expand to an extensive yet finite number before they stop growing. One cell can grow for almost 60 population doublings, producing in excess of one billion daughter cells, conceptually providing enough cells to help in the recovery of damaged or diseased tissue. The scientists are currently searching for the rare cells in other organs of the body. They hypothesize that these “universal patch kits” are scattered throughout the body of adult men and women. The special cells were discovered and isolated in healthy breast tissue from women of various ages and ethnicities who were undergoing breast reductions. All tissues used in the study were devoid of visible disease or contamination. “The observation that rare cells within an adult human body have the capacity to differentiate into many tissue types under different physiological cues will facilitate a fascinating area of research into the physiology and therapeutic potential of these cells,” said lead author Somdutta Roy, PhD, Department of Pathology and the UCSF Helen Diller Family Comprehensive Cancer Center. Imagine if you could take living cells, load them into a printer, and squirt out a 3D tissue that could develop into a kidney or a heart. Scientists are one step closer to that reality, now that they have developed the first printer for embryonic human stem cells. In a lab dish, hESCs can be placed in a solution that contains the biological cues that tell the cells to develop into specific tissue types, a process called differentiation. The process starts with the cells forming what are called “embryoid bodies.” Cell printers offer a means of producing embryoid bodies of a defined size and shape. In the new study, the cell printer was made from a modified CNC machine (a computer-controlled machining tool) outfitted with two “bio-ink” dispensers: one containing stem cells in a nutrient-rich soup called cell medium and another containing just the medium. 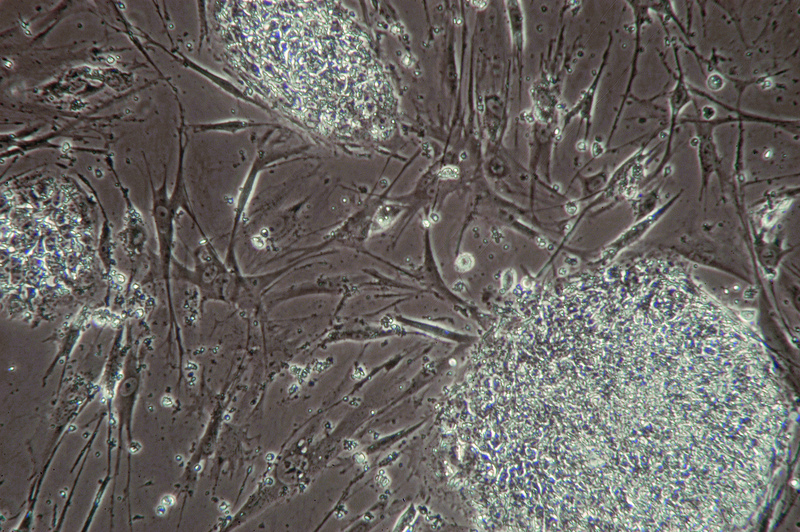 These embryonic stem cells were dispensed through computer-operated valves, while a microscope mounted to the printer provided a close-up view of what was being printed. The two inks were dispensed in layers, one on top of the other to create cell droplets of varying concentration. The smallest droplets were only two nanoliters, containing roughly five cells. The cells were printed onto a dish containing many small wells. The dish was then flipped over so the droplets now hung from them, allowing the stem cells to form clumps inside each well. (The printer lays down the cells in precisely sized droplets and in a certain pattern that is optimal for differentiation.) Tests revealed that more than 95 percent of the cells were still alive 24 hours after being printed, suggesting they had not been killed by the printing process. More than 89 percent of the cells were still alive three days later, and also tested positive for a marker of their pluripotency — their potential to develop into different cell types. Others have created printers for other types of cells. Demirci and colleagues made one that printed embryonic stem cells from mice. Others have printed a kind of human stem cells from connective tissues, which aren’t able to develop into as many cell types as embryonic stem cells. The current study is the first to print embryonic stem cells from humans, researchers report in the Feb. 5 issue of the journal Biofabrication. The primary cilium is organelle that has garnered much attention in the field of cell biology during the last 15 years. It is a slender, solitary hair-like organelle that extends 5-10 uM from each mammalian cell (in the G0 cell cycle state) that is microtubule-based (9 outer doublets arranged in a circular fashion) and dependent on a process called Intraflagellar Transport (IFT). IFT is the bidirectional movement of motors (kinesin-2 in the anterograde and dynein-2 in the retrograde direction) responsible for the assembly and maintenance of the cilium (Pedersen et al., 2006). signal transduction pathways have been found to be coordinated by the primary cilia such as hedgehog, wnt, PDGF among others (Veland et al., 2008). Thus, in 2006, the Christensen lab at the University of Copenhagen (Denmark) with the collaboration of Dr. Peter Satir’s group at Albert Einstein College of Medicine (Bronx, NY) began to investigate whether the human embryonic stem cells (hESCs) possess primary cilium and then to begin preliminary molecular dissections of the role that this organelle could play in the proliferation and differentiation profiles of these pluripotent cells. The Albert Einstein group, due to NIH restrictions, had to work with two federally-sanctioned cell lines. Working with the Laboratory of Reproductive Biology at RigsHospital, the Danish side had access to in-house derived stem cell lines from discarded blastocysts. The advantage for the Danish side was obvious since these newer cell lines hadn’t undergone as many passages as the NIH cell lines and were thus more robust. To begin preliminary characterizations of these lines, some basic hallmarks of hESCs (Bernhardt et al., 2012) had to be localized to the nucleus such as the transcription factor (TF) Oct4 (Fig. 1). In addition, a single primary cilium can be seen denoted by the acetylated tubulin staining emanating from each cell in the micrographs. Also, the base of the cilium is marked by the presence of pericentrin and centrin which demarcate the centriole. Fig. 1 Primary cilia stained with anti-acetylated tubulin (tb, red) are indicated by arrows and undifferentiated stem cells are identified by nuclear colocalization of OCT-4 (green) and DAPI (dark blue) in the merged image (light blue). A primary cilium (tb, red, arrow) in undifferentiated hESCs emerges from one of the centrioles (asterisks) marked with anti-centrin (centrin, green). Inset shows anti-pericentrin localization to base of cilia (Pctn, green). Together, the three labs were the first to discover primary cilia in stem cells while other groups have since then confirmed these findings (Kiprilov et al. 2008; Han et al. 2008). Attention was then to characterize different signal transduction pathways in the stem cell cilium. Since the hedgehog pathway has been shown to be important for differentiation and proliferation (Cerdan and Bhatia, 2012), the groups characterized this signal pathway in these cells using immunofluorescence, electron microscopy and qPCR techniques. One particularly interesting experiment to show that the hedgehog pathway was functional in these cells was to add the hedgehog agonist, SAG (Smoothened agonist), and then to isolate the cells for immunofluorescence at different times. Gradually, one can see the appearance of the smoothened protein into the cilium as indicated by increasing intensity of the immunofluorescence staining. Conversely, patched levels in the cilium, decreased. This is a hallmark of hedgehog activation (Fig. 2). Fig. 2 Immunofluorescence micrographs of hESC showing smoothened (green), acetylated tubulin (red) and DAPI (blue). The micrographs from left to right represents SAG treatments at t = 0, 1 and 4 hours. However, an additional interesting observation was made concerning these stem cells. An important characteristic for stem cells is the presence of certain transcription factors which render these cells in the pluripotent or undifferentiated state. These include Oct4, Sox2, and Nanog whose localization had been observed in the nucleus as expected for other TFs. However, the Danish groups curiously found a subpopulation of stem cells where these TFs were additionally localized to the primary cilium (Fig. 3). This had never been observed or investigated before. Additionally, proper negative controls were carried out to exclude this phenomenon from being an artifact (e.g. bleed through). Fig. 3 Stem cell markers (Sox2, Nanog, and Oct4) localizing to the nucleus and the primary cilia (arrows) of hESC line LRB003. This and the previous figure show shifted overlay images whereby the green and red channels have been slightly shifted so that the red channel doesn’t swamp out the intensity of the green channels. Thus, it raises an intriguing possibility that perhaps the primary cilia plays a previously uncharacterized role in the differentiation/proliferation state of the hESCs via possible modifications of these TFs perhaps analogous to the processing of the Gli transcription factors (Hui and Angers, 2011). Another curious observation is that the subpopulation of cells whose primary cilia are positive for these TFs always occur in clusters which might hint at its mechanistic explanation. In conclusion, since stem cells are now being more routinely used for regenerative medicine such as repair of severed spinal cord (Lu et al. 2012), it behooves us to better learn the molecular mechanisms that keeps these invaluable cells in an undifferentiated state so that we can harness their full therapeutic potential. Awan A, Oliveri RS, Jensen PL, Christensen ST, Andersen CY. 2010 Immunoflourescence and mRNA analysis of human embryonic stem cells (hESCs) grown under feeder-free conditions. Methods Mol Biol. 584:195-210. Bernhardt M, Galach M, Novak D, Utikal J. 2012 Mediators of induced pluripotency and their role in cancer cells – current scientific knowledge and future perspectives. Biotechnol J. 7:810-821. Cerdan C, Bhatia M. 2010 Novel roles for Notch, Wnt and Hedgehog in hematopoesis derived from human pluripotent stem cells. Int J Dev Biol. 54:955-963. Han YG, Spassky N, Romaguera-Ros M, Garcia-Verdugo JM, Aguilar A, Schneider-Maunoury S, Alvarez-Buylla A. 2008 Hedgehog signaling and primary cilia are required for the formation of adult neural stem cells.Nat Neurosci. 11:277-284. Hui CC, Angers S. 2011 Gli proteins in development and disease. Annu Rev Cell Dev Biol. 27:513-537. Kiprilov EN, Awan A, Desprat R, Velho M, Clement CA, Byskov AG, Andersen CY, Satir P, Bouhassira EE, Christensen ST, Hirsch RE 2008 Human embryonic stem cells in culture possess primary cilia with hedgehog signaling machinery. J Cell Biol. 2008 180:897-904. Lu P, Wang Y, Graham L, McHale K, Gao M, Wu D, Brock J, Blesch A, Rosenzweig ES, Havton LA, Zheng B, Conner JM, Marsala M, Tuszynski MH. 2012 Long-distance growth and connectivity of neural stem cells after severe spinal cord injury. Cell 150:1264-73. Nielsen SK, Møllgård K, Clement CA, Veland IR, Awan A, Yoder BK, Novak I, Christensen ST. 2008 Characterization of primary cilia and Hedgehog signaling during development of the human pancreas and in human pancreatic duct cancer cell lines. Dev Dyn. 237:2039-52. Pazour GJ, Dickert BL, Vucica Y, Seeley ES, Rosenbaum JL, Witman GB, Cole DG. 2000 Chlamydomonas IFT88 and its mouse homologue, polycystic kidney disease gene tg737, are required for assembly of cilia and flagella. J Cell Biol 151: 709-18. Pedersen LB, Veland IR, Schrøder JM, Christensen ST. 2008 Assembly of primary cilia. Dev Dyn. 237:1993-2006. Veland IR, Awan A, Pedersen LB, Yoder BK, Christensen ST. 2009 Primary cilia and signaling pathways in mammalian development, health and disease. Nephron Physiol. 111: 39-53. Discovery of Primary Cilia in Stem Cells. The National Task Force on Stem Cell Therapy Treatment, which comprises a group of respected doctors, with influence from the archdiocese, proposed to the Minister of Health, Dr. Perry Gomez calling for an overhaul of existing legislation concerning medical tourism in the Bahamas. Stem Cell research and therapy has the potential to generate over $100 million in the medical tourism industry, according to the government’s task force, which delivered its verdict on the country’s proposed plunge into the controversial science yesterday. “We put together the framework for stem cell work to be carried out to the benefit of Bahamians in an ethical way and to support the potential for a medical tourism industry, and we delved into the specifics of what can be done and what should not be done.” said Dr Arthur Porter. The National Task Force on Stem Cell Therapy Treatment has recommended to the Bahamas Government that embryonic stem cells should not be used to create human stem cells in this country, said the Task Force’s chairman and managing director of the Cancer Centre, Professor Arthur T. Porter. Professor Porter presented a copy of the Task Force’s recommendations to Minister of Health the Hon. Dr. Perry Gomez during a press conference held at the Ministry of Health, Thursday, December 27, 2012. The Chairman told Dr. Gomez that the Task Force’s members unanimously support all of the recommendations within the report. In November 2012, the Bahamas Government appointed the Task Force to develop a series of recommendations regarding the possible use of Stem Cell Therapy in The Bahamas. The Committee had to weigh all the pros and cons associated with Stem Cell use, including the more controversial use of embryonic Stem Cells. The Task Force also had to look at how adult Stem Cells would be used. Members of the Task Force include Dr. Robin Roberts, Director, University of the West Indies School of Clinical Medicine and Research, Bahamas Campus; Rev. Angela Palacious, Anglican Archdiocese; Dr. Duane Sands, Senior Cardiovascular Surgeon, Princess Margaret Hospital; Dr. Paul Ward, Chief of Services, Rand Memorial Hospital, Grand Bahama; Dr. Barrett McCartney, Senior Anesthesiologist and Pain Specialist, Doctors Hospital and Dr. Indira Martin, Laboratory Research, Ministry of Health. Dr. Wesley Francis, President of the Medical Association of The Bahamas; Dr. Glen Beneby, Medical Director, Public Hospitals Authority and Mrs. Michelle Pindling-Sands, Attorney-at-law, also sit on the Task Force. When the Task Force was first introduced, Professor Porter explained that there are two types of stem cells. “Embryonic cells usually derive from a five-day embryo or earlier, which have the ability to become any cell in the body whether a brain cell, a fat cell or a nerve cell. They are pluripotent (capable of differentiating into one of many cell types). “The second type are the adult stem cells, which are smaller in quantity and can be found in most tissue and organ systems, but which lack the flexibility of what they can be, and so scientist have tried to take some of the adult Stem Cells and make them able to be more or less like embryonic stem cells to sort of get around the problem.” Professor Porter explained that during the Task Force’s deliberations, it was found that there is no need for the use of embryonic Stem Cells, because research is finding that adult Stem Cells can be transformed to be able to act as Induced Pluripotent Stem Cells. As a result, he said there is no need to focus on embryonic stem cells in The Bahamas. Professor Porter said many have asked the Task Force for an opinion regarding reproductive human cloning. “The Task Force was quite committed in its opinion that reproductive cloning should not be permitted.” He added that the Task Force felt that it was important that there be widespread education and consultation with various stakeholder groups that will be involved in making the ultimate decision, so people would become aware of the importance of Stem Cells, some of the ethical issues and be able to opine in this regard. Professor Porter said the Task Force believed that Stem Cells would be an important part of the country’s medical tourism thrust, but the Government needs to broadly review what is necessary for a successful medical tourism industry. Dr. Sands added, “We have to understand that this is a rapidly evolving field and there are many countries in the world that have embraced medical tourism and as such have tried desperately to ensure the process of approval or the rapid acceleration of new projects is done in a timely fashion. “Similarly, efforts have been made to ensure that phenomenal scrutiny of the proposed projects, the participants, etc., is carefully done. He said legislation in The Bahamas has to be robust enough to protect the integrity and the reputation of the country while at the same time promoting good science and this is an on-going process. “We need to make sure the laws are constantly keeping up with what is happening on the ground.” Dr. Gomez said after he reviews the report, he would present it to Cabinet early next year so that policies can be made surrounding Stem Cell Therapy in the country. Millions of people in the United States suffer with type 1 diabetes and are unable to produce sufficient insulin. “As of 2010, 25.8 million people—8.3% of the population—have diabetes; 1.9 million new cases of diabetes were diagnosed in people aged 20 years or older in 2010.” (http://www.cdc.gov/diabetes/consumer/research.htm) “… About 27 percent of those with diabetes—7 million Americans—do not know they have the disease. Pre-diabetes affects 35 percent of adults aged 20 and older. (http://www.cdc.gov/media/releases/2011/p0126_diabetes.html) The potential to transplant insulin-producing cells into patients suffering from Diabetes would be a critical step forward and could offer hope for a long-term cure. The potential to one day treat type 1 diabetes using transplants of insulin-producing beta-cells derived from pancreatic progenitors may have just crept a tad closer, if findings by a group of researchers at the University of California, San Diego (UCSD) can be verified. The team has identified a cell surface marker on a subpopulation of cells in the pancreas that appears to identify them as pancreatic stem cells (PnSCs), a cell type which has never actually been firmly demonstrated in human or animal tissues. A current approach to cell replacement therapy for diabetes involves the transplantation of pancreatic islets, which involves numerous transplant procedures. Although it is feasibly possible to derive insulin-producing cells from either human embryonic stem cells (hESCs) or induced pluripotent stem cells (iPSCs), there are technical issues which have yet to be solved. What is ideally needed is a source of stem cells derived directly from the pancreas that can readily be prompted to differentiate into the desired cell type. Research by Alberto Hayek, Ph.D., and colleagues now indicates that human pancreatic ductal cells that express the cell surface stem cell marker stage-specific embryonic antigen 4 (SSEA4) may represent this elusive population of PnSCs that has long been postulated but never quite isolated. The cells, located in the exocrine portion of the adult human pancreas but not inside islets themselves, also express ductal, pancreatic progenitor, and stem cell protein markers. Interestingly, the investigators found that SSEA4-expressing cells isolated from fetal pancreatic tissue additionally express a recognized marker of endocrine progenitor cells. Notably, when the UCSDF team then isolated adult human pancreatic SSEA4+ cells and cultured them in media containing high levels of glucose and B27 supplements, the cells formed aggregate-like spheres and differentiated readily into pancreatic hormone-expressing cells. “Accumulated evidence supports the concept that pancreatic stem/progenitor cells may originate in the pancreatic duct, where they reside in a quiescent stage,” the authors remark. “We are first to identify SSEA4+ cells in the adult human pancreas with characteristics of pancreatic progenitors. Further clonal analysis would confirm their stemness…. The discovery of specific markers for the identification and purification of human PnSCs would greatly facilitate studies aimed at the expansion of these cells and the development of targeting tools for their potential induction to insulin-producing cells. What sounds like great news may actually be barely worth mentioning. Embryonic stem cells restored hearing in gerbils. So, what are the problems?? A cure for deafness caused by auditory neuropathy is one step closer, after a breakthrough in stem cell therapy by UK researchers. Published online before print in the 12 September online issue of the prestigious scientific journal Nature, researchers from the University of Sheffield describe how they successfully restored hearing to previously deaf gerbils using human embryonic stem cells. Stem-cell biologist Marcelo Rivolta led the project, which brings hope to some of the 275 million people worldwide with moderate-to-profound hearing loss, many of whom have it as a result of a defect in the auditory nerve, also called the cochlear nerve or acoustic nerve, which causes a faulty link between the inner ear and the brain. This new discovery opens the doors to a possible new way of treating deafness in a group of people who are unable to be helped by existing technology and treatments. Human stem cells restore hearing in deaf gerbils – National health | Examiner.com. Embryonic Pluripotency May Give Up Secrets – But So What? More forward looking statements (without any of the standard legalese on risks, assumptions and uncertainty) regarding the great mystery of embryonic stem cells maybe, sort of, perhaps, soon to give up it’s secrets. Embryonic stem cells have pluripotency. Discovery of the methods and aspects which allow for pluripotency in embryonic stem cells are definitely a research milestone and one which will advance many lines of inquiry in various fields of medicine…but…there are a few major issues, particularly in the USA. There are already ADULT stem cells which ARE PLURIPOTENT and can be used for treatment. The US is in a bitter tug of war in both accurate media coverage of stem cells and research and use of adult versus embryonic stem cells. Pharma is trying to make drugs out of this stuff and get patents on it. In most cases, your own body can supply the necessary stem cells for your own treatment. And of course, the controversy issues of utilizing embryonic stem cells which will cause the religious right to exert huge resistance on any advancement of embryonic stem cell research in the US. ZERO EMBRYONIC STEM CELL TREATMENTS. ADULT stem cells are here, now, powerful, safe and effective. What are you waiting for? ScienceDaily (July 18, 2012) — New research at the Hebrew University of Jerusalem sheds light on pluripotency — the ability of embryonic stem cells to renew themselves indefinitely and to differentiate into all types of mature cells. Solving this problem, which is a major challenge in modern biology, could expedite the use of embryonic stem cells in cell therapy and regenerative medicine. If scientists can replicate the mechanisms that make pluripotency possible, they could create cells in the laboratory which could be implanted in humans to cure diseases characterized by cell death, such as Alzheimer’s, Parkinson’s, diabetes and other degenerative diseases. To shed light on these processes, researchers in the lab of Dr. Eran Meshorer, in the Department of Genetics at the Hebrew University’s Alexander Silberman Institute of Life Sciences, are combining molecular, microscopic and genomic approaches. Meshorer’s team is focusing on epigenetic pathways — which cause biological changes without a corresponding change in the DNA sequence — that are specific to embryonic stem cells. The molecular basis for epigenetic mechanisms is chromatin, which is comprised of a cell’s DNA and structural and regulatory proteins. In groundbreaking research performed by Shai Melcer, a PhD student in the Meshorer lab, the mechanisms which support an “open” chromatin conformation in embryonic stem cells were examined. The researchers found that chromatin is less condensed in embryonic stem cells, allowing them the flexibility or “functional plasticity” to turn into any kind of cell. A distinct pattern of chemical modifications of chromatin structural proteins (referred to as the acetylation and methylation of histones) enables a looser chromatin configuration in embryonic stem cells. During the early stages of differentiation, this pattern changes to facilitate chromatin compaction. But even more interestingly, the authors found that a nuclear lamina protein, lamin A, is also a part of the secret. In all differentiated cell types, lamin A binds compacted domains of chromatin and anchors them to the cell’s nuclear envelope. Lamin A is absent from embryonic stem cells and this may enable the freer, more dynamic chromatin state in the cell nucleus. The authors believe that chromatin plasticity is tantamount to functional plasticity since chromatin is made up of DNA that includes all genes and codes for all proteins in any living cell. Understanding the mechanisms that regulate chromatin function will enable intelligent manipulations of embryonic stem cells in the future. As the head of the technology office, Holdren would also be co-chair of the President’s Council of Advisors on Science and Technology, along with Harvard geneticist Eric Lander and Harold Varmus, the Nobel Prize-winning virologist who is president of the Memorial Sloan-Kettering Cancer Center in New York. All three declined to be interviewed until after Holdren’s confirmation. Leonard Zon, a Harvard stem cell scientist who knows Lander and Varmus and has followed Holdren’s career, said the three men are likely to recommend more federal support for embryonic stem cell research, and budget increases for the National Institutes of Health, the U.S. agency that backs the bulk of basic science conducted at academic institutions. Stem cell transplantation seems to stop and, in some cases, undo neurological damage in people with multiple sclerosis, a small study shows. The trial involved just 21 patients, but a larger, randomized trial is under way in the United States, Canada and Brazil. ”This is the first trial for any phase of MS, whether early or later, of any therapy anywhere that has shown reversal of neurological disability,” said study author Dr. Richard K. Burt, chief of the division of immunotherapy at the Northwestern University Feinberg School of Medicine in Chicago. MS is a disease in which the immune system turns on the body and attacks myelin, the protective covering on nerve cells. The disease usually starts with a ”relapse-remitting” phase, with alternating periods of flare-ups of symptoms and relatively peaceful spans. After a decade or so, however, most patients move into the more severe, secondary-progressive form of the disease. ”There is a need to find a means by which we can control the progression of MS, particularly in these patients who are not responding to FDA-approved therapies,” said Patricia O‘Looney, vice president of biomedical research at the National Multiple Sclerosis Society. Treatments are clustered toward the relapse-remitting stage, with little available for the latter stage. ”Generally, when you get to late progressive MS, nothing really works,” Burt said. The technique used in this study, autologous non-myeloablative hemopoietic stem cell transplantation, ”resets” the immune system and is already used for secondary-progressive MS.
via The Punch: Stem cell transplants help MS victims.